In the early Nineteen Twenties, just after the war, a young man tired of living in a back room in the city persuaded a bemused Sussex farmer to rent him a derelict cottage. It stood alone on a hill, had no water or electricity, and was full of rats. Many of the window panes were broken and it was damp, dirty and dingy. He bought a brush and pail in the village and cleaned it up, fought a war against the rats, then put in some rudimentary furniture. The local postman found him a dog for company, somewhat improbably claimed to be a Shetland collie. Then he started to explore his domain, surrounded on three sides by a stream often all but impassable when in spate. 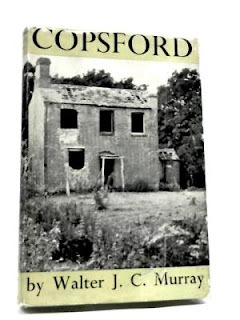 He lived for a year at Copsford (the name of the house), through all the seasons, while he tried to make a living from collecting, drying and selling the herbs he could find locally, such as foxgloves, agrimony, meadow-sweet, tansy , eyebright and yarrow. He came to know the natural surroundings intimately, alert to the living and growing things around him. Together with modest payments from occasional journalism, he just about made ends meet (he will share his sparse accounts with us), but it was hard and mostly lonely work. However, he had a friend in the village, whom he calls The Music Mistress, and we’re soon delighted to gather that he and she (and the dog) will be forming a new way of life together there. And some years, and another war, later, he wrote a book about his experiences. Although his account is firstly a personal memoir and secondly a natural history study, it is also, in its subtle, diffident way, a record of such fleeting visionary experiences. Copsford (Allen & Unwin, 1948), the book he wrote about his experiences, was an unexpected success and was reissued in 1950 in a popular edition by the Readers' Union. It has become something of a quietly sought-after book since. People who encounter it are apt to be unusually impressed by its fugitive qualities, its curious mood, and by the compelling honesty of the account. Early copies are surprisingly hard to find, even in the RU edition, though there was a HarperCollins reprint in 1986 that is now more readily available. One devoted champion of the book has recorded The Copsford Project, a short film of a visit to the site of the house, now demolished, where only the front door step and a few other half-buried signs remain. Local historian Tom Wareham has written a biography of Murray, The Green Man of Horam, The Life and Work of Walter J C Murray (2017), and also explores his nature mysticism, which he suggests has elements in common with the work of Richard Jefferies, author of The Story of My Heart (1883). Murray went on to start a school in the village of Horam, with The Music Mistress, and also wrote about a nature sanctuary he founded there, and published other books of natural history and topography, some in collaboration, and a guide to Romney Marsh. But with Copsford he created one of those singular books, haunted by elusive qualities, that leave the reader wistful, in a mood of mingled joy and melancholy. Thanks for this. I got hold of the book on interlibrary loan and read it, with much enjoyment. It deserves reprinting. It has affinities with Wendell Berry's book The Long-Legged House, which includes a section called "A Native Hill," etc.